Behind our home in the lush Pacific Northwest is a gulch with fir trees down in the draw along with maple and cypress. The bottom by the creek is virtually impenetrable with English ivy and pesky blackberry bushes. In the summer and fall the green foliage covers to the extent that you can’t see the forest floor, the creek, or the rotting rowboat that leans against the giant maple. When autumn comes around and the trees start to lose their summer clothes, the ivy and vines begin to retreat to wherever they go in the winter. From my elevated back deck I can see deeper into the wooded bottom, almost to the creek that flows year round in the draw. The rowboat still isn’t visible because the bank is too steep and the angle isn’t right from the deck, but a few feet away I can see the faint outline of a metallic and skeletal structure. Leaves fall like small kites landing gently on the ground revealing what’s left of a child’s ancient swing set. The wooded backyard was ruled by laughter and joy. Children once squealed with glee on that equipment, but no child has touched it in years, however the equipment stands tall and erect amongst the firs, ivy, and blackberry bushes. 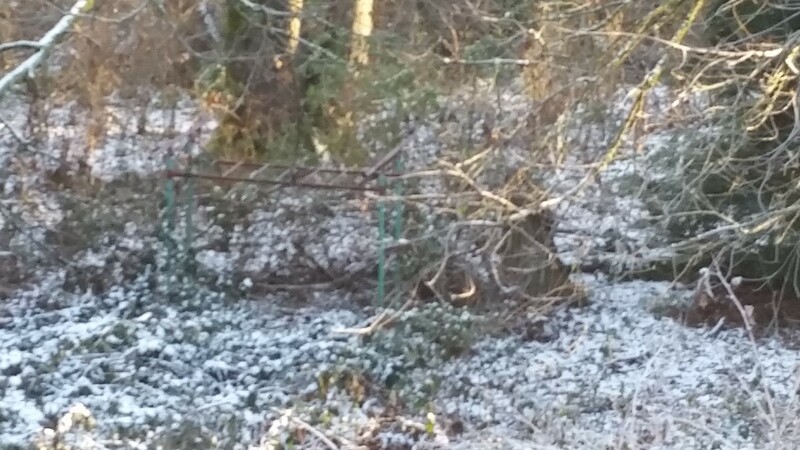 I suppose the metal will eventually rust away and the elements will leach into the loamy soil; maybe the relentless blackberry bushes will pull it down like prey to be devoured by moisture and oxidation into the brown leaves. For now the metal, paint, bolts, and nuts stand in defiance of the inevitable. But make no mistake, death and decay are overtaking the old joy-making machine. Wrapping the fleece closer to my sagging shoulders, I stare at the play set. In it I see meaning, deep meaning. Sociologists suggest that people have a difficult time describing or even identifying something that they don’t have the vocabulary for. Some even suggest that you can have a hard time experiencing something for which you have no corresponding word. The Greeks had a word for the feeling you have when you are happy: makarios. It is a feeling of contentment when you know your place in the world and are satisfied with that place. If your life has been fortunate, you should feel makarios. Those tubes and chains of metal in the bottom of the gulch remind me of wasted years building my life on false sources of what I long for—joy unspeakable and full of glory. A scaffolding of career success, peer approval, solid reputation, and a sense of accomplishment. And yet they are all mere child’s play when viewed from elevated platform of middle life. They are illusory. They will not withstand the relentless ravages of time and the toxicity of sin. I wonder if we would put our weight on something altogether different at an earlier age than the external structures this world prizes so highly if we might feel content with our place in the world. What if we stood firmly on the bedrock certainty that we are loved by our heavenly Father? Unshakably loved. If we began earlier in our pilgrimage to rest in that safe knowledge of unconditional acceptance founded on grace the structure hidden in the undergrowth of our soul might remain hidden, for joy is shy that way, but the day is coming when what is hidden will be revealed. If not in this life, in the life to come—eternity waits for no one. Often what is most shy and obscure about our souls is what matters most. Give a care upon that which you play in this life. Soon enough we will skip and play in the company of the Joy-Giver in an eternal garden. And laughter will once again rule the day. I am the beloved of the Most High God. I am an avid reader and writer and have been a continuous learner since my college studies in Ancient Literature and English. I live at the base of Mount Princeton in the Colorado Rockies with my wife of over three decades. I believe I have been put here to tell people that God is not mad at them and to show them the way Home. I am the father of three sons, three beautiful daughters-in-law and four grandchildren. I love to read, tell stories, and spend time in the wilderness. This entry was posted in Uncategorized and tagged Change, downward spiral, environment, faith, God, grace, healing, Love, midlife, success. Bookmark the permalink. This is one of your very best pieces! Thank you for putting “pen to paper” so to speak.